For over 85 years, Wilton has been making it easy for everyone to create amazing cakes and sweet treats. 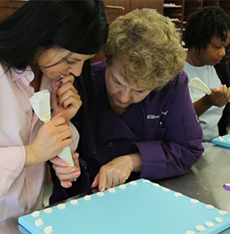 Based in Darien, IL, The Wilton School of Cake Decorating and Confectionery Art is where it all started. It’s the place where Wilton Method techniques were developed and taught to generations of decorators from all over the world. 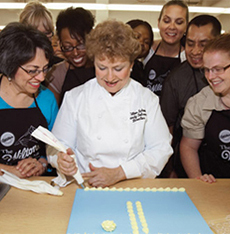 The Wilton School offers classes in buttercream, royal icing, fondant, gum paste, sugar, as well as baking classes for cakes, pastry and bread. We welcome students of all ages (make sure to check out our kids classes!) and all skill levels! Whether you are a beginner or advanced we have a class for you. Browse and register for a class today! Discover a wide range of cake decorating and baking classes that we are offering this year. Get a comprehensive education in decorating and baking through our world renowned Master Series Program. Hands on instruction from Wilton instructors, industry professionals and world class decorators. Take a beginner's class (Check out or Decorating 101 classes) or explore a new medium and take one of our workshops. 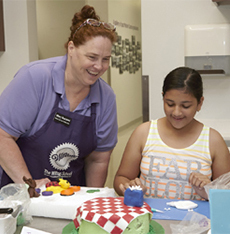 Let kids explore their inner chef by taking one of our kids' classes! We also offer kids party packages for a unique birthday experience!